This week I’m going to continue my dissertation about our dear Lusitano. This time, I’m talking about a subject that’s kind of a taboo in our society these days... "Bullfights", hated by some, loved by many, are subject to criticism and praise, debates and discussions, rivalries and passions. But what leads me to write about bullfighting is not the controversy it causes, but the passion I have for our beautiful Lusitano horse. All the characteristics, morphological and of personality, described in the previous article result from a secular selection. Horses of the Kings, Lusitanos could only be noble horses. Selected for war and fighting, they could only be brave and suffering horses. Portuguese horses, they could only be victorious. The current Lusitanian for having an "easy command" allows the bullfighter to perform his functions as a rider based on the three main rules of a fight, Parar, Templar e Mandar, concepts that would only be associated with bullfighting on foot if there were not such an antique selection of our horse. 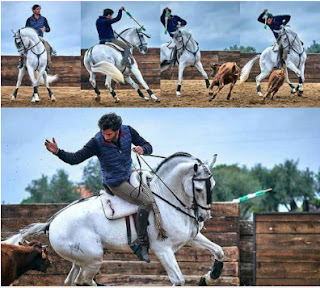 The Lusitano is able to insert himself with ease in the performance of several elements of “high school”, exercises of high difficulty, with a very light contact on the hand. We’re talking about exercises such as, isolated or tempie flying changes, pirouettes at one time, passage, piaffer, half-passes, and all that inserted in a circumference of short diameter. All this comes from a very important feature that I have not yet mentioned, the EQUILIBRIUM. Bullfighting has, as the most truthful moment, the “frontal luck” and the lusitano horse can do it in an exemplary way, with the inclusion of the bases of the bullfighting: Parar, which means, fundamentally, to stop, wait and give primacy to the opponent's attack; Templar, which consists in imparting a sense of slowness, achieved through the cadenced and impelled gallop of a superb amplitude allowing variations of rhythm; and Mandar, which is to impose trajectories until the moment of the meeting. A meeting that the Lusitano horse allows to be realized slowly, with expression on the body and the face, which demonstrates his virile, fighting and victorious personality. Photo taken by Frederico Henriques - in the photo Paco Velasquez and Duelo da Broa. These characteristics corroborate the thesis that the selection must always follow the objectives of functionality and maneuverability, and here, the talent of the Portuguese breeders has proven to be remarkable. They have often selected for functionality in their dream of obtaining the ideal horse for the requirements of the users. The bullfighting was thus the laboratory of creation by excellence of the Lusitano, in which there was always a perfect symbiosis between the riders and the breeders. This narrow and important selection allowed us to obtain a horse of a unique beauty, unequaled generosity, magical souplesse, and with an enviable quality which has led our horse to international arenas, competing among the world’s best and achieving historical results as the 12th place in the 2008 Olympic Games in Beijing, a result achieved by the Lusitano Rubi AR, from one of the oldest studs in our country that has always selected based on the functionality and the aptitude for the “high school” exercises executed by the magnificent riders of the Portuguese School of Equestrian Art. And that’s it, this week we finish the sequence of three articles related to the Lusitano. We’ll sure be back to him since the Lusitanos are the horses we work with more often!